The entire halogen family forms oxides. Many halogen oxides have been reported however most of them are unstable. These are illustrated in the table shown below. Halogen-oxygen bonds are highly covalent due to the similarities in electronegativity of halogens and oxygen. Fluorine is more electronegative than oxygen; therefore compounds of fluorine with oxygen are taken as fluorides of oxygen instead of oxides of fluorine. I2O5 is the only halogen oxide that is stable with respect to the dissociation into elements. Chlorine oxides decompose violently whereas the bromine oxides are the least stable among the halogen oxides. Of these just Cl2O and ClO2 find some practical significance as bleaching agents in paper pulp and flour industries; I2O5 is employed in the estimation of CO. It is a stable colourless gas. It reacts vigorously with metals, sulphur, phosphorus and halogens and provides fluorides and oxides. It reacts with bases to provide F- ion and free oxygen. Cl2O and Br2O are made up by heating freshly precipitated mercuric oxide by the halogen. It is a white solid which decomposes to iodine and oxygen over 573 K. I2O5 is a good oxidising agent, it oxidizes H2S to sulphur and HCl to chlorine. All the oxides of halogens encompass positive free energies of formation apart from F2O and are therefore unstable with respect to dissociation into elements. F2O is stable upto 475 k. The combination of kinetic and thermodynamic factors leads to usually decreasing order of stability I > Cl > Br. The higher oxides tend to be more stable than the lower. Apart from for that of iodine all oxides tend to be explosive. Iodine pentoxide, I2O5, is white solid stable upto 575 K. Due to their oxidising properties, chlorine oxides, Cl2O and ClO2 are employed as bleaching agents and as germicides. I2O5 quantitatively oxidizes CO to CO2 and thus, is employed in the estimation of CO.
Only the structures of OF2, Cl2O, Br2O, Cl2O7 and I2O5 are definitely known. Structures of the monoxides can be illustrated on the basis of VSEPR theory. These oxides encompass tetrahedral structure having two lone pairs on oxygen. Therefore, the molecule is 'V' shaped or angular in shape. The bond angle EOE differs in the order FOF < ClOCl < BrOBr. This is due to electrons in case of OF2 are closer to fluorine because of high electronegativity of F as compared to Cl or Br. The bonded electron pairs in Cl2O and Br2O are closer to oxygen making the repulsion between them more and thus reducing the lone pair-lone pair repulsion on oxygen to certain extent. As well due to the bulkiness of Cl and Br, the angles ClOC1 and BrOBr increase to such an extent which they are greater than 109°28', the tetrahedral angle. The figure shown below exhibits some of the structures of halogen oxides. The oxoacids having higher number of oxygen atoms, that is, having halogens in higher oxidation state are thermally more stable and are recognized in the pure state. We might compare this with the increased, stability in case of higher oxides of halogens. Though, the thermal stability reduces with increase in the atomic number of the halogen. Therefore, HOCl is the most stable and HOI the least stable among the hypohalous acids. 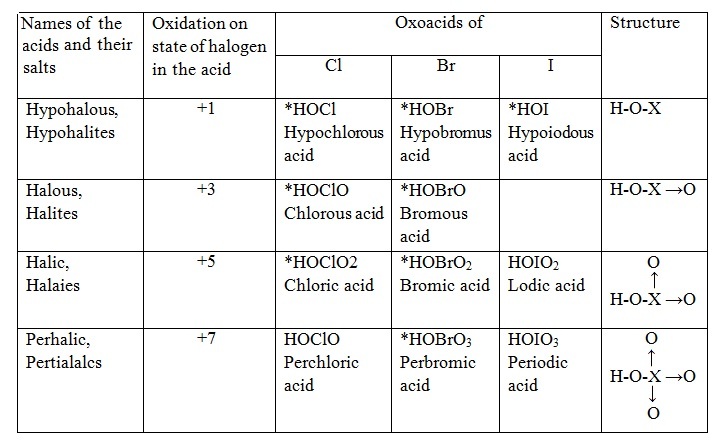 The acid strength of oxoacids rises with the increase in oxidation number of halogen. This can be illustrated as follows. As oxygen is more electronegative than halogens (consider just Cl, Br and I), the terminal oxygen atom pulls the electrons of O-X bond towards itself, leaving a small positive charge on the halogen atom. The halogen atom then draws the electrons of X-OH bond towards itself. The oxygen atom in turn pulls the electrons of O-H bond towards itself, departing hydrogen atom slightly positively charged and making the O-H bond more simply ionisable. This makes the compound more acidic. This is evident from the above that higher the oxidation number of the halogen, higher is the number of oxygen atoms joined to the halogen, more efficient is the displacement of shared electrons towards the terminal oxygen atoms and more acidic is the oxoacids. The acid strength of oxoacids having halogen in the similar oxidation state reduces as we go down the group. Therefore HOCl is the strongest and HOI is the weakest amongst such acids. Hypoiodic acid is amphoteric and might be considered as iodine hydroxide, IOH, in numerous reactions. Decrease in acid strength of respective oxoacids down the group might be illustrated on the basis of reducing electronegativity of the halogens. NaOCl is one of the significant salts of hypochlorous acid and is employed in bleaching cotton fabrics, wood pulp and as well as a disinfectant. Anhydrous perchloric acid, HClO4, is a very powerful oxidising agent that explodes whenever in contact with organic matter and at times on its own. Periodic acid, HIO4, is widely employed in organic chemistry for the oxidation of alkenes to glycols. Compounds made by the interaction of one halogen by other halogens are termed as interhalogen compounds. These compounds are either binary, made up by a combination of two halogens or ternary, made up by a combination of three halogens. The binary compounds are of four kinds, namely, XY, XY3, XY5 and XY7; here X and Y are the two halogens and Y is more electronegative as compare to X. Interhalogen compounds are named as the halides of less electronegative halogen. Therefore GIF is termed as chlorine monofluoride and not fluorine monochloride. Ternary interhalogen compounds were unidentified until recently apart from as polyhalide anions or polyhalonium cations, however now some compounds, example, IFCl2 and IF2Cl have been made up. The interhalogen compounds having fluorine are more common. The stability of interhalogen compounds based on the electronegativity difference of the two halogens. The greater the difference, the more polar is the bond and thus, the greater is the thermal stability and the higher their boiling and melting points. Some of the physical properties of the interhalogen compounds such as colour are intermediate between those of the constituent elements however their boiling and melting points are higher than expected from interpolation of the boiling and melting points of the constituent halogens. Several properties of interhalogen compounds are represented in the table below. Therefore, the substances that furnish ICl2+ and BrF2+ behave as acids and those furnishing ICl4- and BrF4- behave as bases in ICl3 and BrF3 solvent systems, correspondingly. The interhalogen compounds are usually covalent in which the bigger atom lies in the centre. Their shapes can be predicted via VSEPR theory. The shapes of some of the interhalogen compounds are illustrated in the table below. 1) Type XY: As predicted, the compounds of the kind XY are linear. Therefore ClF, BrF, BrCl, IBr and ICl all encompass a linear structure. In such compounds both the halogen atoms encompass an unpaired electron in the pz orbital. Axial overlap of the pz orbitals of the two halogen atoms yields in a linear interhalogen molecule. 2) Type XY3: The structure of Interhalogen of this kind can be illustrated on the basis of sp3d hybridization of the central halogen atom X. Three of the hybrid orbitals having an electron each are employed in making three covalent bonds by three atoms of the other halogen atom. The remaining two orbitals accommodate the two lone pairs of the central atom. In order to minimize the lone pair-lone pair and lone pair-bond pair repulsions, the lone pairs engage the two equatorial sites around the central halogen atom, thus giving a T-shape to the molecule. Therefore ClF3, BrF3 and ICl3 encompass a T-shaped structure. 3) Type XY5: This kind of compounds consists of a square pyramidal structure. The central atom 'X' utilizes five of its seven valence electrons in making five bonds with 'Y' and two electrons remain as a lone pair. Therefore X-atom in X Ys molecule is sp3d hybridized. The lone pair engages the axial hybrid orbital. 4) Type XY7: In such molecules, the central 'X' atom employs all its seven valence electrons in making seven X-Y bonds. The formation of this kind of compounds can be illustrated on the basis of sp3d2 hybridization of the X atom. Such compounds encompass a pentagonal bipyramidal structure by two axial X-Y bonds and five equatorial X-Y bonds.